Dictyostelium life cycle consists of two distinct phases – growth and development. The control of growth-differentiation transition in Dictyostelium is not completely understood, and only few genes involved in this process are known. We have isolated a REMI (restriction enzyme-mediated integration) mutant, which prematurely initiates multicellular development. When grown on a bacterial lawn, these cells aggregate before the bacteria are completely cleared. In bacterial suspension, mutant cells express the developmental marker discoidin Iγ even at low cell densities and high concentrations of bacteria. In the absence of nutrients, mutant cells aggregate more rapidly than wild type, but the rest of development is unaffected and normal fruiting bodies are formed. The disrupted gene shows substantial homology to the recently described gdt1 gene, and therefore was named gdt2. While GDT1 and GDT2 are similar in many ways, there are intriguing differences. GDT2 contains a well conserved protein kinase domain, unlike GDT1, whose kinase domain is probably non-functional. The gdt2 and gdt1 mRNAs are regulated differently, with gdt2 but not gdt1 expressed throughout development. The phenotypes of gdt2- and gdt1- mutants are related but not identical. While both initiate development early, gdt2- cells grow at a normal rate, unlike gdt1- mutants. Protein kinase A levels and activity are essentially normal in growing gdt2- mutants, implying that GDT2 regulates a pathway that acts separately from PKA. Gdt1 and gdt2 are the first identified members of a family containing at least eight closely related genes. We have isolated and characterised a new gene, gdt2, which acts to restrain development until conditions are appropriate. We also described a family of related genes in the Dictyostelium genome. We hypothesise that different family members might control similar cellular processes, but respond to different environmental cues. Dictyostelium discoideum is a social amoeba whose life cycle consists of two distinct phases – growth and development. As long as nutrients are abundant, Dictyostelium cells grow as individual amoebae. When nutrients are depleted, starving cells aggregate to form a multicellular mound, and finally differentiate into fruiting bodies, consisting of several different cell types. The switch from growth to differentiation is controlled by a number of interacting factors, including the nutritional state of cells, measures of the food supply, and a range of extracellular signals. Several of these signals are generated by nearby Dictyostelium cells. Some allow cells to judge the local density of competitors, while others allow populations of cells to cooperate and develop simultaneously. We are currently well short of an understanding of how all these signals are interpreted by cells and integrated to allow a switch in the genetic programme. During growth Dictyostelium cells continuously synthesize and secrete autocrine factors which accumulate in proportion to cell density. At appropriate concentrations these factors cause changes in gene expression and prepare cells for the initiation of development. A glycoprotein called prestarvation factor (PSF) is secreted by growing cells . The effect of this protein is counteracted by food bacteria. Cells can detect the level of PSF and thus estimate their own density relative to the abundance of the food source . The "prestarvation response" occurs during increasing of PSF levels and decreasing of food source, and can be detected a few generations before actual starvation occurs. The discoidin I gene family is among the first genes to be activated in the prestarvation response. When food is depleted and cells stop growing, PSF production declines and a separate starvation response is activated. Starving cells secrete another glycoprotein, condition medium factor (CMF), which is essential for establishing of cAMP signalling and the initiation of aggregation [3, 4]. Starvation causes a further increase in discoidin expression, after which discoidin continues to accumulate in early development until its transcription is inhibited by extracellular cAMP at the end of aggregation phase. Expression of discoidin is therefore an excellent reporter for the state of cells within the developmental programme. Several genes have been found to regulate the growth-differentiation transition (GDT) in Dictyostelium. Protein kinase A (PKA) plays a critical role and has been implicated in multiple pathways involved in later development. Strains carrying disruptions in PKA exhibit arrest of development on early stage and fail to aggregate . Similarly, the protein kinase YakA, homolog of yeast Yak1p growth regulating protein kinase, is also required for the turning off of growth stage genes and induction of developmental genes . YakA- mutant cells are also unable to aggregate. Other genes regulating the growth-differentiation transition include Dia2, a gene of yet unknown function , and also amiA and amiB [8, 9]. AmiA is homologous to a yeast gene of unknown function, while amiB does not show homology to any known genes. Both genes positively regulate the growth-differentiation transition possibly via regulation of adenylyl cyclase expression. Three negative regulators of the growth-differentiation transition have been described. PufA encodes a member of Puf protein family of translational regulators . PufA is a translational inhibitor of PKA mRNA, and its levels are downregulated by the YakA kinase. Dia1, a gene with no homology to any known genes, appears to be negatively coupled to both the cAMP receptor cAR1 and the adenylyl cyclase ACA . Antisense-mediated inactivation of dia1 enhances the progression of differentiation. Finally, gdt1 is a gene which encodes a transmembrane protein with a kinase-homology domain , although interestingly the kinase domain is unlikely to be functionally active. Gdt1 null cells display accelerated aggregation. Examination of double PKA-/gdt1- mutants and in vitro phosphorylation data show that gdt1 is likely to be a downstream target of PKA . In this study we identify a new gene related to gdt1. Like gdt1, gdt2 acts as a negative regulator of the growth-differentiation transition in Dictyostelium. We demonstrate that GDT1 and GDT2 exemplify a family of related proteins which together may serve to mediate the full complexity of the transition between growth and differentiation. The mutant described in this study was found during a screen of REMI-mutagenised library for mutants resistant to propranolol, a phospholipase D (PLD) pathway inhibitor. The original goal of the screen was to discover new genes involved in PLD function. We isolated a REMI mutant, IR32, which was able to aggregate on Klebsiella lawns in the presence of 1 mM propranolol. Under these conditions the parental Ax2 cells are totally unable to initiate aggregation (data not shown). However, both growth and development of IR32 cells were inhibited to the same extent as wild type cells by butan-1-ol, another PLD inhibitor (data not shown). It therefore appeared that the gene disrupted by REMI was involved in the initiation of development, rather than being part of a PLD signalling pathway. A fragment of the disrupted gene was isolated from mutant IR32 by plasmid rescue using genomic DNA digested with BclI. The sequence of this fragment was used to search Dictyostelium genome project databases. 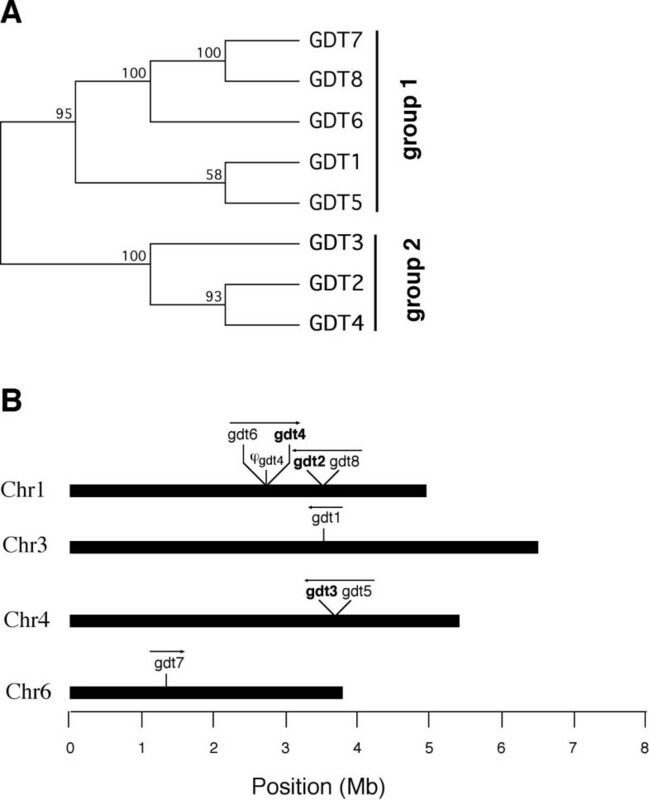 Several partial cDNA clones and genomic contigs were found, allowing us to identify the disrupted gene as a homologue of the Dictyostelium gdt1 gene . This new gene was therefore named gdt2. The gdt2 coding region was interrupted by REMI about 4 kb downstream of predicted start of the ORF (Fig. 1A). To prove that this disruption caused the phenotype, and that the phenotype was the result of a simple loss of function, we generated fresh mutants disrupted in the first half of the gdt2 gene. Several clones were identified by colony phenotype and shown by Southern blot to carry an insertion in gdt2 gene (Fig. 1B). All gdt2- clones displayed the same phenotype (data not shown) and were found to be identical in phenotype to the original REMI mutant IR32. Identification of the gdt 2 gene. (A) Schematic map of the gdt2 gene. The coding sequence is shown as open boxes, the site of REMI insertion is indicated with an arrow. The site of the Blasticidin insertion in the knockout construct is shown with triangle. Sequences used as probes for Southern and Northern blots are schematically shown below. (B) Southern blot analysis of one of the gdt2 knockout clones, g14, and wild type Ax2 cells. Genomic DNA was digested with BclI and hybridized with the probe shown in (A). (C) Predicted amino acid sequence of GDT2. The GDT2 protein is composed of 1637 amino acids. The signal sequence (AA 1-21) is boxed and the putative transmembrane domains (AA 129-145, 167-184 and 897-921) are underlined. The putative kinase domain (AA 1284-1535) is shown in bold. Both gdt2- and IR32 mutants made plaques with unusual morphology when grown on bacterial lawns. Likewise, each displayed accelerated aggregation when developed on non-nutrient agar (see below). This confirmed that the original REMI insertion caused the phenotype of IR32. Sequence analysis of the genomic contig revealed an open reading frame of 4.6 kb, interrupted by 5 small introns. The ORF within the gdt2 gene is predicted to produce a protein of 1637 amino acids, with a mass of 185 kDa. Analysis of the predicted protein by structure-predicting programmes (SMART, TMHMM and MEMSAT) revealed an N-terminal signal sequence for secretion/membrane inclusion, at least 1 and most likely 3 potential transmembrane domains, and a kinase homology domain at the C-terminal end of the protein (Fig 1C). As mentioned above, GDT2 showed substantial homology to GDT1 . It is worth mentioning that the original gdt1 sequence deposited in the database was incomplete at its 5' end. Our analysis showed that GDT1 has an extra 101 amino acids at its N-terminus, the first 20 of which represent a putative signal sequence. The kinase domain of GDT1 is interrupted by a poly-Asn containing insert and presents many substitutions to well conserved amino acids, particularly in the catalytic loop. It is therefore presumed to be non-functional. The kinase domain of GDT2 is uninterrupted and includes all the typical amino acids for a classical serine/threonine protein kinases. It therefore seems likely that GDT2, unlike GDT1, is a fully functional protein kinase. Analysis of the Dictyostelium genome revealed a family of genes which were closely related to gdt1 and gdt2. As shown in Fig. 2 and 3, we identified six additional full-length genes and one pseudogene (gdt1 DDB0215003, gdt2 DDB0201878, gdt3 DDB0186734, gdt4 DDB0201754, gdt5 DDB0186736, gdt6 DDB0201749, gdt7 DDB0184322, gdt8 DDB0201879 at The Dictyostelium Database ). Three of the full-length genes (gdt2, gdt3 and gdt4) encode complete, well conserved (and therefore presumably functional) kinase domains; another three (gdt1, gdt6 and gdt8) seem to encode proteins with degenerate protein kinase domains. GDT5 presents a C-terminal sequence unrelated to protein kinases, while GDT7 appears truncated and stops before the protein kinase domain. All the GDT proteins share extensive homology in first 1000 amino acids (700 for the truncated GDT7) despite some insertions or deletions. All the homologs start with a clear signal sequence for secretion/membrane inclusion. Additionally, all have at least one strongly predicted transmembrane domain located between amino acids 600 to 1000 and two weaker ones in the region of amino acids 120 to 200. Since the proteins are well conserved, they should also share the same topology. Combining the transmembrane predictions with the multiple alignment leads to the proposed model of 3 transmembrane domains (Fig. 2). Neighbor joining phylogenetic analysis clustered these genes into two groups, with group 2 containing the three functional kinases and group 1 containing the others (Fig. 3A). In the genome the gdt genes form 3 clusters of two genes each plus two singletons (Fig. 3B). Each cluster includes a member of the groups 1 and 2, suggesting that the clusters arose by duplications of an initial tandem pair of genes. A family of proteins related to GDT1 and GDT2. 8 GDT proteins are shown schematically. SMART, TMHMM and MEMSAT programs were used for sequence analysis. The level of grey indicates the extent of conservation. 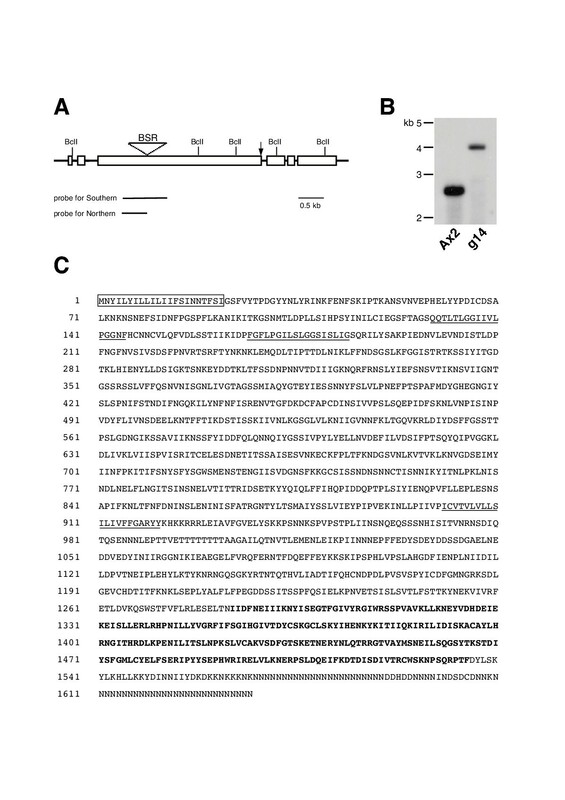 SS – signal sequence, TM – transmembrane domain, R – repetitive polyAsn-containing sequences, IN – predicted cytoplasmic domains, OUT – predicted lumenal/extracellular domains. The putative kinase domains are marked with "+" if they appear to be functional or with "-" if they are degenerate. Gdt gene family in the Dictyostelium genome. (A) Neighbor joining tree of the gdt gene family in the Dictyostelium genome. Only the topology of the tree is shown. Bootstrap support of the internal nodes is shown over the branches. (B) Localisation of the gdt genes on Dictyostelium chromosomes. Direction of the transcription is shown with arrows. Genes with predicted functional kinase domains are shown in bold. To analyse expression of the gdt2 gene, we carried out Northern blot analyses using a gdt2 cDNA fragment as a probe. RNA samples were prepared from wild type cells in a vegetative stage and at different time points of development. As shown in Fig. 4, during exponential growth expression of gdt2 mRNA does not depend upon cell density. The gdt2 mRNA is expressed at about the same level in vegetative cells and throughout development, with a slight peak at the time when the cells are aggregating. This is in sharp contrast to gdt1, which has been shown to be expressed in vegetative cells only . Expression of the gdt 2 gene. (A) Expression of gdt2 mRNA in vegetative cells. mRNA was prepared from axenically grown wild type Ax2 cells at the cell densities indicated. (B) Expression of gdt2 mRNA during development. Ax2 cells were harvested from axenic medium during exponential growth, washed and plated on non-nutrient agar for development. Cells were collected and mRNA prepared at the time points indicated. The blot was hybridised with the probe shown in Fig. 1A. Colonies of gdt2- cells on bacterial plates displayed an unusual morphology. 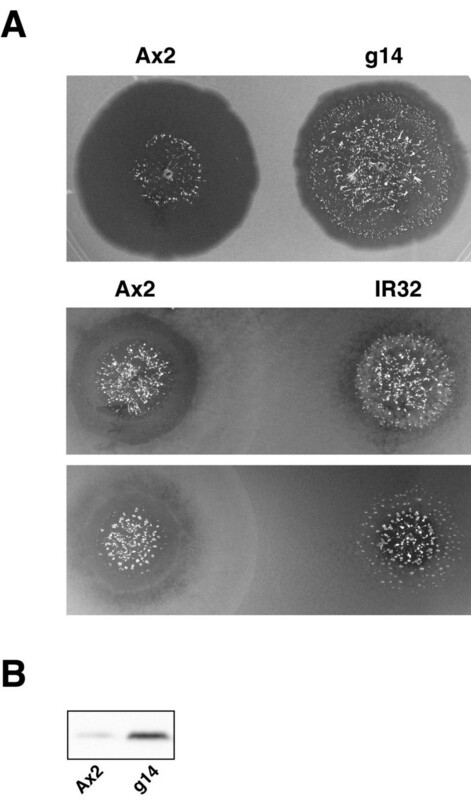 Cells aggregated very close to the growing edge of the colony – or in some cases even within the bacterial lawn, while Ax2 cells made colonies with clear preaggregation zones (Fig. 5A). Phenotype of the gdt 2 - mutant. (A) Colony phenotype. 500 cells of wild type and either g14 (the knockout clone) or IR32 (the original REMI mutant) were spotted on the same SM agar plate and left to grow for 5 days. Both REMI and knockout clones show very narrow or absent clearing zones. 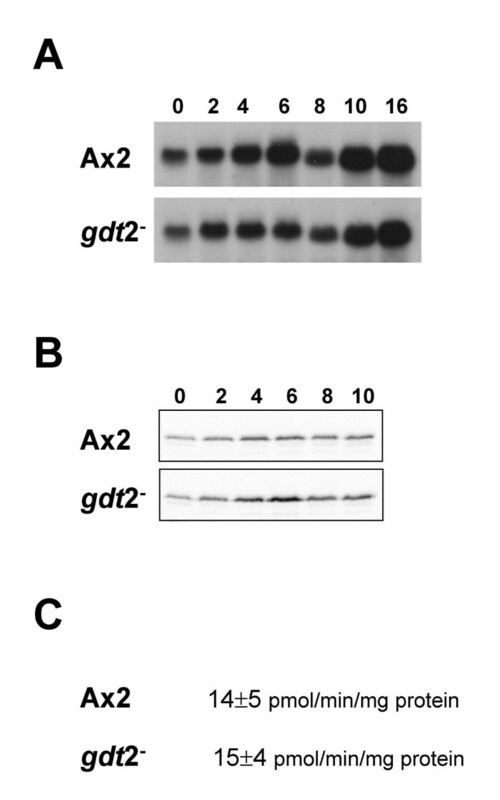 (B) Overexpression of discoidin I by gdt2- mutant at low cell densities. Ax2 and g14 cells were grown in bacterial suspension and harvested at a density of 1 × 106 cells/ml. Discoidin I was detected by Western blot analysis with an anti-discoidin I antibody. A similar phenotype has been described in other mutants, in particular HBW3 , and gdt1 nulls . Since both HBW3 and gdt1- null mutants overexpress discoidin, we decided to measure discoidin expression in gdt2- cells. Wild type cells and gdt2- mutants were grown in bacterial suspension and harvested at a density of 1 × 106 cells/ml. Expression of discoidin I was monitored on Western blots using an anti-discoidin I antibody. Although levels of discoidin expression varied somewhat from experiment to experiment, a significant amount of discoidin was always detected in the mutant, even at very low cell densities (Fig. 5B). In wild type cells growing in bacterial suspension, discoidin can normally be detected at cell densities above 1 × 106 cells/ml, whereas in gdt2- cells discoidin was detected even at a density of 1 × 105 cells/ml (data not shown). In wild type cells, expression of discoidin is induced a few generations before starvation and then gradually increases with further cell proliferation. To determine whether discoidin expression in gdt2- mutant changes with increasing cell density, discoidin I expression was analysed at different stages of exponential growth. Wild type cells and gdt2 mutants were grown in bacterial suspension and harvested at densities of 1 × 106, 2 × 106 and 6 × 106 cells/ml. Despite the fact that discoidin expression was significantly increased in growing gdt2- mutants compared to Ax2 wild type cells at all cell densities, the amount of discoidin protein still increased with cell density (Fig. 6A). Thus, gdt2- cells are still able to estimate the number of neighbouring cells and accordingly produce and detect autocrine factors such as PSF. Sensitivity of gdt 2 - mutants to cell density and food supply. 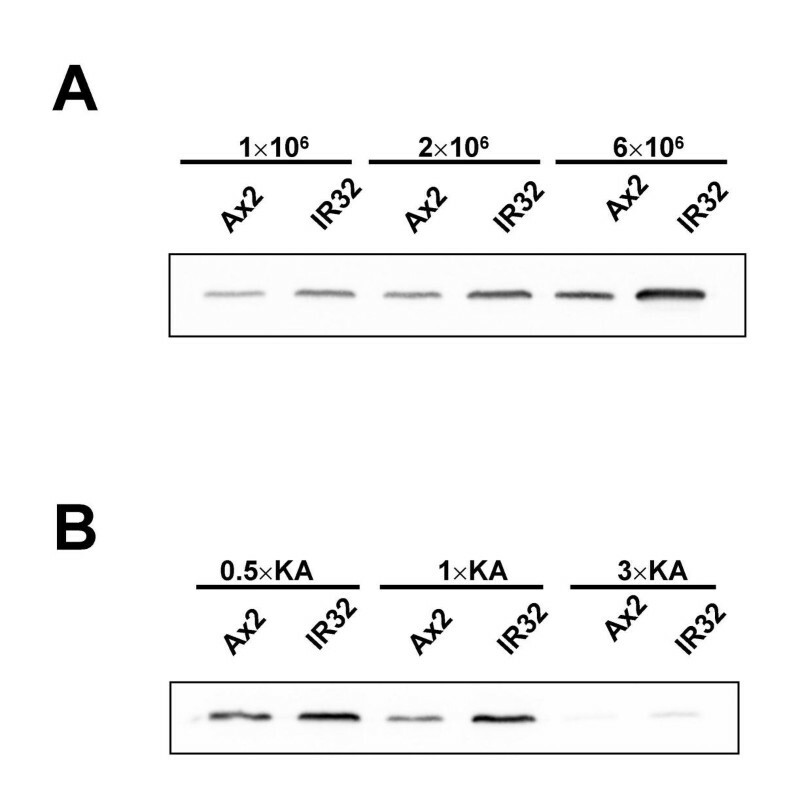 (A) Ax2 and IR32 cells were grown in 1 × KA suspension and harvested at the cells densities indicated. 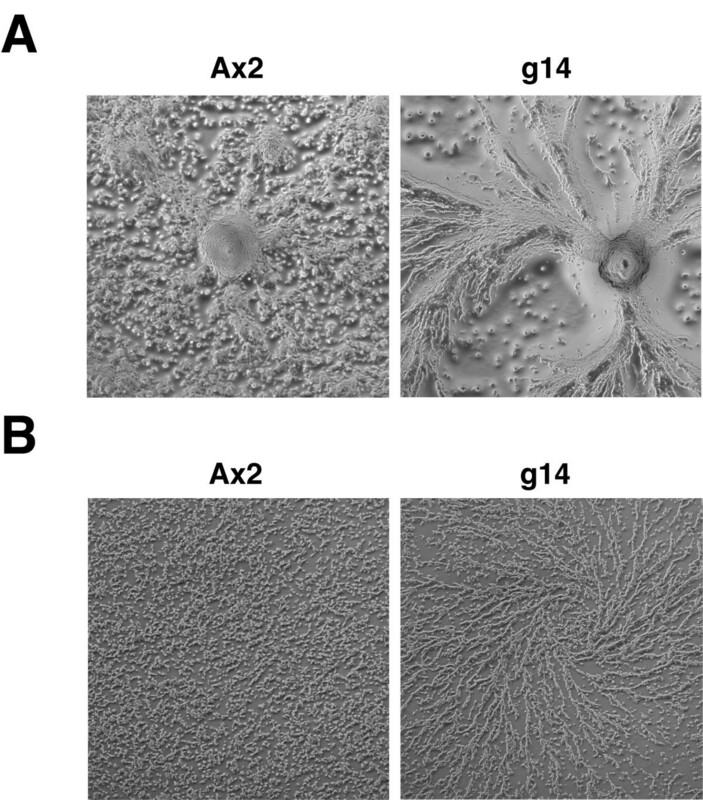 (B) Ax2 and IR32 cells were grown in 0.5×, 1× and 3 × KA suspensions and harvested at a density of 1.2 × 106 cells/ml. Discoidin I was detected by Western blot analysis with an anti-discoidin I antibody. Wild type cells start to express discoidin at a relatively low cell density when the nutrient supply is limited, but high nutrient supply restricts expression to higher cell densities. To understand whether the onset of development in gdt2- mutants is regulated by amount of food, expression of discoidin I was measured in cells that had reached the same cell density growing in bacterial suspensions of different saturation. Ax2 and gdt2- cells were grown in Klebsiella suspensions of different concentrations and harvested at a density of 1.2 × 106 cells/ml. In wild type cells, discoidin was detected at normal or reduced concentrations of bacteria and was not detected at all at 3× bacterial concentration. In the gdt2- mutant, some protein was still detectable even in cells grown in the most concentrated bacterial suspension (Fig 6B). The expression of discoidin in the mutant still decreased with increasing concentration of food, although the starting level was higher. Therefore, gdt2- cells are still able to sense the concentration of food. Taken together, these data demonstrate that although the gdt2- mutants made the decision to start development even at unusually low cell densities and high concentration of the food source, the onset of development was still to some extent regulated by cell density and concentration of food. gdt2- cells grow at the same rate as parental Ax2 cells in axenic culture and in bacterial suspension (data not shown). To investigate whether development is impaired in gdt2- mutants, mutant and wild type cells were allowed to develop on non-nutrient agar plates. Development was monitored microscopically. gdt2- cells consistently started to aggregate 1–1.5 hours earlier than wild type Ax2 cells (Fig. 7A), but the rest of their development proceeded normally – they successfully finished aggregation and formed fruiting bodies just before or in some experiments at about the same time as wild type (data not shown). Accelerated aggregation of gdt 2 - . (A) Aggregation on non-nutrient agar. (B) Aggregation in submerged culture. Cells were harvested at exponential growth phase, washed, plated at a density of 2 × 105 cells/cm2 and incubated at 22°C. Photographs were taken after 7.5 hours (A) or 8 hours (B). Under both conditions gdt2- mutant cells start to aggregate about 1–1.5 hours earlier than wild type cells. We also observed aggregation of starved cells in submerged culture. As expected, gdt2- cells started to aggregate earlier than wild type, with about the same time difference as we had seen on non-nutrient agar (Fig. 7B). This demonstrated that the disruption of gdt2 specifically accelerates the growth/differentiation transition, but does not significantly affect later development. Folate is a known chemoattractant for growing Dictyostelium cells. It can also function as an extracellular signal that inhibits development. Folate has been shown to inhibit discoidin expression when added to axenically growing wild type cells . To determine whether the gdt2- phenotype is due to a loss of sensitivity to folate, we investigated the ability of gdt2- mutant to respond to different levels of folate in the medium. Our preliminary data showed that gdt2- mutants responded normally to folate in a chemotaxis assay (data not shown). To test whether discoidin expression is regulated by folate in the gdt2- mutant, cells were grown in axenic medium and treated with 1 mM folate for various times, while cell density was maintained at around 106 cells/ml. In wild type cells discoidin expression was considerably reduced after 8 hours of folate treatment and was nearly undetectable thereafter (Fig. 8). gdt2- cells, on the other hand, produced a higher amount of discoidin than wild type cells, but expression of discoidin clearly decreased under folate treatment. Thus, the phenotype of the mutant was not caused by an inability to sense folate levels. Sensitivity of gdt 2 - mutants to folate. Ax2 and g14 cells were grown in axenic medium in presence of 1 mM folate while cell density was maintained at about 1 × 106 cells/ml. Samples were removed at the time points indicated. 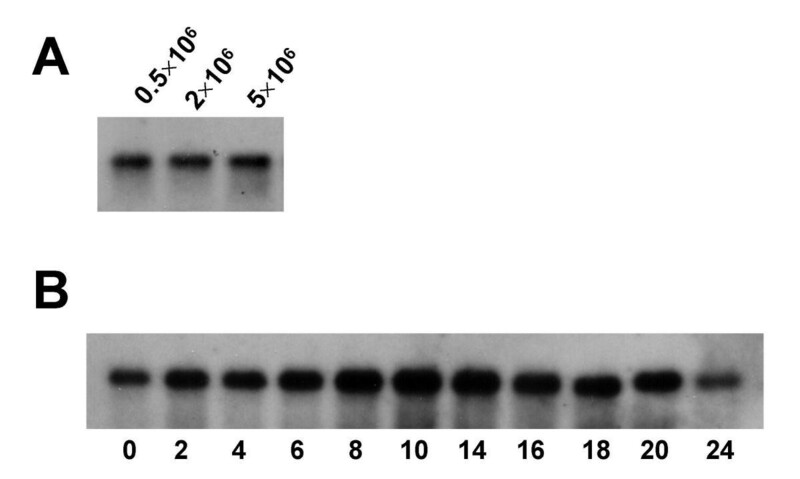 Discoidin I was detected by Western blot analysis with an anti-discoidin I antibody. Since gdt2- mutants exhibit accelerated aggregation, but can in general estimate the quantity of food, it seemed possible that they are impaired in sensing of some specific food components. Earlier studies had shown that amino acids specifically inhibit initiation of development . In our experiments, gdt2- cells starved in submerged culture started to form aggregation streams after 8 hours of incubation, whereas Ax2 cells started to aggregate about 1 hour later (see Fig. 7). When the buffer was supplemented with essential amino acids and glucose (see Methods), both wild type and mutant cells exhibited delayed aggregation compared to unsupplemented buffer, but the delay was more substantial for wild type cells. gdt2- cells started to make streams after 13–14 hours of incubation, whereas wild type cells started to stream only after 18–19 hours. As shown in figure 9A, after 25 hours of incubation gdt2- mutant cells had completed aggregation and made mounds, whereas Ax2 cells were still streaming. Thus, while the mutant was still able to sense amino acids, it was considerably less sensitive than the wild type. Aggregation of gdt 2 - cells in the presence of amino acids and folate. 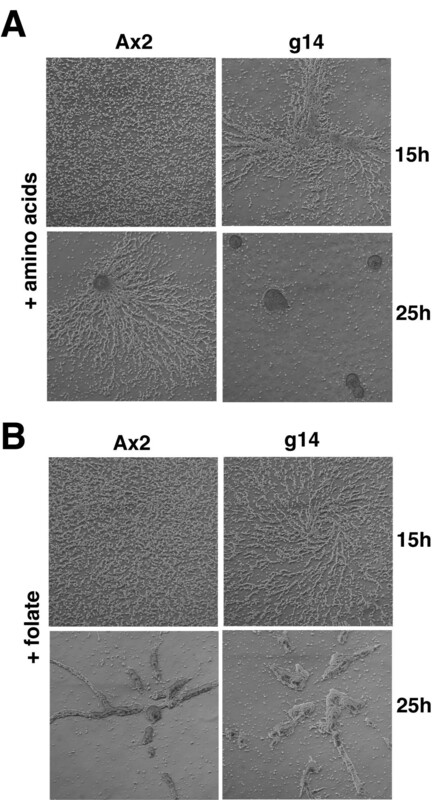 Cells were harvested from axenic culture at exponential growth phase, washed and plated at a density of 2 × 105 cells/cm2 in buffer containing either amino acids (A) or 1 mM folate (B). In the presence of amino acids gdt2- mutant cells aggregate 4–5 hours earlier than wild type, while in the presence of folate they aggregate only 1 hour earlier than wild type, as they do in unsupplemented buffer. To determine whether this effect was specific to amino acids, we used folate to inhibit aggregation. Folate at a concentration of 10 μM caused 1.5–2 hours delay in starting aggregation in submerged culture. Under this folate concentration the time difference in starting aggregation between the mutant and wild type was about 1 hour (data not shown). Higher concentrations of folate caused stronger inhibition of aggregation. Cells incubated in the presence of 1 mM folate started to aggregate after 15 hours (even later than cells incubated with amino acids), but the time difference in starting aggregation was again the same between the mutant and wild type – about 1 hour. After 25 hours both wild type and the mutant were breaking streams and making mounds (Fig. 9B). The above experiments show that the gdt2 mutant is clearly different from wild type in its response to amino acids, but it is not significantly different in folate response. A large body of work has shown that PKA is a major regulator of early Dictyostelium development. Overactivation of PKA leads to premature aggregation , while loss of the catalytic subunit results in cells that never initiate development . Since gdt2- mutants showed premature aggregation, we investigated PKA expression and activity in the mutant and in the wild type. Our preliminary data using H-89, cell permeable inhibitor of PKA [20–22], showed that discoidin expression was inhibited upon PKA inhibition in the mutant to about the same extent as in the wild type (data not shown). It suggests that the disruption of gdt2 caused an increase in the level of discoidin expression but did not greatly affect its PKA-dependent regulation. Northern blots showed that mRNA of the catalytic subunit of PKA (PKA-C) was expressed at about the same level in the mutant as in wild type in vegetative cells (Fig. 10A). After 3–4 hours of starvation, expression of PKA-C mRNA increased in both wild type and the mutant, though it increased somewhat more in the wild type. Interestingly, the expression of PKA-C protein was slightly higher in the mutant than in wild type at corresponding time points of development (Fig. 10B). However, although there were some differences between PKA mRNA and protein levels later in development, both were very similar in growing cells at the stage when gdt2- mutants prematurely initiate development. Protein kinase A expression and activity. mRNA (A) and protein (B) extracts were prepared from vegetative cells and cells at different time points of development. Northern blots (A) were probed to visualise PKA-C mRNA, and Western blots (B) were probed with anti PKA-C antibody. (C) PKA enzyme activity, measured in vegetative cells at a density of 2 × 105 cells/ml growing on bacteria. Data shown represent mean ± SE from 3 independent experiments. PKA activity is regulated by signalling through the regulatory subunit as well as by protein abundance. We directly assayed PKA activity in vegetative wild type and gdt2- cells grown on bacteria. The difference in PKA activity was indistinguishable (Fig. 10C). Taken together, this data indicate that GDT2 does not exert its effects by modulating PKA activity. It remains possible that it acts downstream of PKA and mediates a subset of cellular responses. The soil amoeba Dictyostelium discoideum has a relatively simple developmental programme compared to higher eukaryotic multicellular organisms. Nonetheless, the change from growth to development is regulated by a complex series of signals designed to ensure that aggregation only occurs under optimal conditions. In the prestarvation response, during which cells anticipate future starvation and prepare to develop, expression of a number of genes is induced, and when starvation occurs and cells are triggered to aggregate, changes in gene expression occur in a wholesale fashion. Recent studies of gene transcription profiles show that aggregation of unicellular amoebae to multicellular structures is accompanied by a change in the expression of more than 25% of the genes in the genome . In this work we have described a new gene, gdt2, which is important for the control of this process. We isolated a REMI mutant which was able to develop in the presence of propranolol. The mutated gene was found to be a novel gene. The mutant showed premature expression of discoidin and premature aggregation. Morphological development was not affected in gdt2- mutants, thus allowing us to assume that gdt2 was predominantly involved in the growth-differentiation transition, but was not essential for later development. It is clear that the prestarvation response in Dictyostelium depends on two major factors: cell density and the abundance of food [2, 24, 25]. It is possible that the gdt2- mutant was impaired in calculating the density of neighbouring cells and/or in sensing of food. We have shown here that gdt2- cells are able to estimate their own density (see Fig. 6), but we cannot exclude that the mutant has either enhanced PSF production or a higher sensitivity to PSF. However, it is more likely that the mechanisms of sensing some of food components are seriously impaired, although not abolished in the mutant. Our measurements of amino acid sensitivity support this hypothesis. In addition, the gdt2 mRNA is expressed during growth and throughout development (Fig. 4), which may reflect a role for the gdt2 gene product in dedifferentiation as well as the primary decision to initiate development. Mutants lacking gdt1 show similar phenotypes to gdt2- mutants. The gdt1- mutants also overexpress discoidin and show premature entry into the developmental cycle . However, there are major differences. The gdt1- mutants display slow growth compared to wild type cells, whereas gdt2- cells grow at the same rate as wild type. 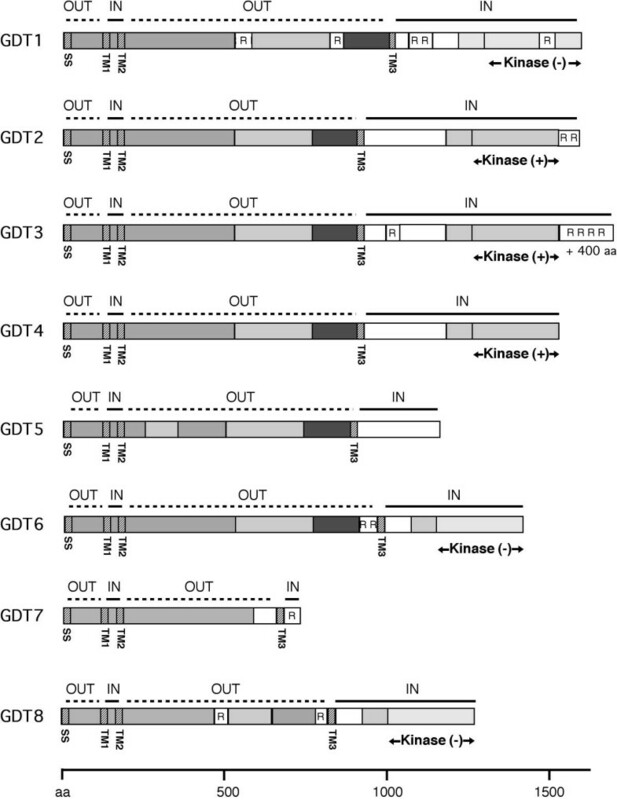 mRNA expression patterns of gdt1 and gdt2 are also different. The expression of gdt1 mRNA increases with cell density in vegetative cells and rapidly decreases after the onset of development [12, 26]. We expected to see a similar pattern of gdt2 mRNA expression, or at least a decrease in mRNA upon starvation. Surprisingly, we found the gdt2 mRNA to be expressed at about the same level in vegetative cells and throughout development. Taken together, the similarities and dissimilarities between gdt1 and gdt2 mutants' phenotypes and gene expression patterns allow us to propose that these two genes possibly regulate some or all of the same cellular processes, but are regulated by parallel signal transduction pathways. These genes are possibly most important at different points in the developmental cycle. It would be interesting to see a phenotype of a double gdt1-/gdt2- mutant, if a double knockout of these genes was possible. Here we have also described a family including gdt1, gdt2 and 6 more genes in the Dictyostelium genome. The similarities between these genes suggest that they all may be involved in regulation of the process of development, probably responding to different extracellular signals. However, the particular roles of the members of the family remain to be explored. We have isolated a Dictyostelium REMI mutant, which initiates multicellular development earlier than the wild type. The genome rescue showed that the disruption occurred in a new gene, which was named gdt2. Gdt2 codes for a transmembrane protein with a kinase domain. Using developmental assays we have shown that gdt2 is involved in control of the growth-differentiation transition. We have also described a family of gdt1  and gdt2 related genes in the Dictyostelium genome. The family is comprised of eight genes coding for transmembrane proteins with and without kinase domains. All gdt genes may be involved in regulation of the process of development in Dictyostelium. Dictyostelium discoideum Ax2 and derived transformants were grown as appropriate in axenic medium (HL-5), in suspension with autoclaved Klebsiella aerogenes (KA), or on lawns of Klebsiella aerogenes growing on SM agar plates. Cells were grown and developed at 22°C. Klebsiella were harvested from SM plates, suspended in KK2 buffer (20 mM potassium phosphate, pH 6.2) at an OD600 = 6.5 and then autoclaved. The resulting medium was used as 1 × KA suspension. 3× and 0.5× suspensions were made by concentrating or diluting 1 × KA, respectively. Prior to inoculation of cells, MgCl2 was added to KA suspensions to a concentration of 2 mM. Dictyostelium cells were inoculated at 5 × 104 cells/ml, shaken at 150 rpm at 22°C and harvested at the cell densities indicated in the text and in figure legends. For the folate sensitivity experiment, cells were grown in axenic medium until they reached a density of 106 cells/ml, after which folate was added to a concentration of 1 mM. Cell density was calculated every 8–10 hours and the culture was diluted with axenic medium containing 1 mM folate to keep the cell density around 106 cells/ml. Cells were harvested at time points indicated. Vegetative cells were harvested from bacterial or axenic suspension cultures at densities of 1–2 × 106 cells/ml and washed free of bacteria/medium in KK2 buffer. For development on non-nutrient agar, cells were resuspended in KK2 supplemented with 2 mM MgCl2, plated on agar plates (2–8 × 105 cells/cm2) and allowed to develop. For aggregation experiments in submerged cultures, cells were resuspended in either KK2 or in aggregation buffer (5 mM Na2HPO4, 5 mM KH2PO4, 7.5 mM NH4Cl, 0.41 mM MgSO4 and 0.34 mM CaCl2, pH 6.8). Two millilitre portions containing 6 × 106 amoebae were plated in Ø60 mm tissue culture dishes. For aggregation in presence of folate, folate was added to concentrations of 10 μM to 1 mM after cells were plated. For aggregation in presence of amino acids, cells were resuspended in aggregation buffer or in aggregation buffer supplemented with 10 mg/ml glucose and 0.5 mg/ml of each of the following amino acids: methionine, glycine, isoleucine, valine, arginine histidine, tryptophan, phenylalanine, threonine, lysine. Cells were observed using Zeiss Axiovert 100 microscope with a 5× objective. A REMI-mutagenised Ax2 library  was provided by A. Harwood (UCL, London). To obtain propranolol resistant mutants, the library was selected for growth and development on SM agar/KA plates in presence of 1 mM propranolol. Eight separate clones were isolated and one clone, IR32, was rescued. A 0.5 kb fragment was recovered from the IR32 REMI mutant by plasmid rescue as described by Kuspa and Loomis . Genomic DNA from IR32 was digested with BclI, circularized in a diluted solution and used to transform E. coli. A plasmid containing 0.5 kb of genomic sequence upstream of the insertion site was recovered. The gdt2 knockout vector was constructed by inserting the Blasticidin S resistance (BSR) cassette from pRHI148 into single MscI site of a 2 kb gdt2 fragment, which was generated by PCR from genomic DNA and cloned into pBluescript. The resulting vector was cut with ApaI and NotI to generate the 3.3 kb gdt2/BSR fragment and used to transform Dictyostelium Ax2 cells as described . The resulting transformants were screened by colony phenotype and confirmed by Southern blot. Genomic DNA was prepared using DNAzol reagent (Invitrogen) according to manufacturer's instructions, digested and blotted onto Hybond N+ membranes (Amersham Pharmacia Biotech). Total RNA was extracted using TRI reagent (Sigma). RNA (20 μg per lane) was subjected to electrophoresis in 1.2% agarose/formaldehyde gels and transferred to Hybond N+ membranes. Equal amounts of RNA per lane were loaded as determined by measuring OD at 260 nm and confirmed by ethidium bromide staining. Two fragments of the gdt2 gene were obtained by PCR and used as Southern and Northern blot probes (Fig. 1A). A fragment corresponding to C-terminal part of the catalytic subunit of PKA was also obtained by PCR and used for Northern hybridisation. The fragments for both Southern and Northern blots were radiolabelled using a random primer kit (Amersham Pharmacia Biotech) and [alpha-32P]dATP (ICN). Blots were exposed to X-ray film for 16–48 hours using intensifying screens. Total cell extracts were prepared by lysing Dictyostelium cells in SDS-PAGE loading buffer. Equal amounts of protein (5 to 10 μg) were separated on 12% gel and blotted by tank transfer. Equal loading was confirmed by staining of the membranes with Ponceau S. Discoidin Iγ was detected using a monoclonal antibody 80-52-13 , a generous gift from W. Nellen (Department of Genetics, Kassel University, Germany) and peroxidase coupled anti-mouse antibody. The catalytic subunit of PKA was detected using a polyclonal antibody , a generous gift from F. Traincard (Pasteur Institute, Paris) and peroxidase coupled anti-rabbit antibody. Protein bands were visualized using an ECL Super Signal detection kit (Pierce). Total PKA activity was assayed as previously described , using extract from bacterially grown Dictyostelium cells. The PKA activities are expressed as the amount of phosphorylation of the Kemptide substrate that can be inhibited by the PKA inhibitor PKI. We thank Dr Wolfgang Nellen for kindly providing anti-discoidin antibody, Dr François Traincard for anti-PKA-C antibody and Dr Adrian Harwood for REMI library. We would like to acknowledge the international Dictyostelium genome consortium for providing sequencing data. We are grateful to Dr Dmitry Filatov for careful reading of the manuscript and for advice on phylogenetic reconstruction. R.H.I. was supported by an MRC Senior Fellowship, and this work was supported by an MRC co-operative grant to R.H.I. MVC carried out most of the experimental work and wrote the manuscript. CA participated in genome analysis and performed PKA assays. RHI coordinated the study and participated in manuscript correction.